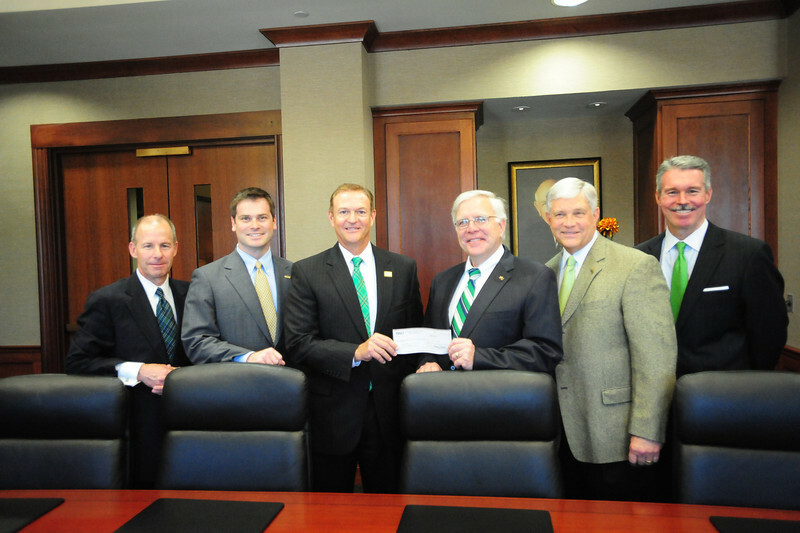 David L. Helmer, Senior Vice President and Regional Corporate Banking Manager for BB&T, third from left, presents a check for $100,000 to Marshall University President Stephen J. Kopp in support of the BB&T Center for the Advancement of American Capitalism at MU’s College of Business. Also representing BB&T, from the left, are John Berry and Spencer Murphy, and from the right are Lance West and Dr. Ronald Area of the Marshall University Foundation. The presentation took place today in the Marshall University Foundation Hall, home of the Erickson Alumni Center on MU’s Huntington campus. Photo by Tyler Kes/Marshall University.